Vox: What if the truth will haunt your dreams for all time? Alexander: Oh well, I think I am used to that. The world described by H.G. Wells in the now legendary novel The Time Machine is the sort that expands the imagination of anyone who is lucky enough to tear through its pages. Growing up, I remember reading The Time Machine countless times and each trip through its pages drove my imagination to the sort of places that only the best novels can go. So it was with a sort of eagerness that I awaited the release of Simon Wells' (the great-grandson of H.G. Wells) The Time Machine, hoping that the recent advances in technology could create worlds that would do justice to the imaginations of so many. When the film was released in March of 2002 (after several delays), I sat in a sort of stunned silence; I held such high hopes for what might unfold before me. Gone was the world so vast and wonderfully realized, as this current version seems to be lacking in everything that made the novel so enjoyable. Put simply, The Time Machine is a mess of a film, the sort that forgoes a script for often amazing special effects and in its wake, creates a disappointment of gigantic proportions. The film centers on Alexander (Pearce), a professor from the turn of the century who dreams of changing the world with his inventions. On the night he is to propose marriage to his girlfriend she is murdered in a robbery attempt and Alexander's world becomes one of sadness and loss. Convinced he can change time, he builds an elaborate machine and travels back to the fateful night with the hopes of making changing the past. Through an unlucky series of events, Alexander uses his time machine to travel into the future: first to 2030, where he sees a world overrun with technology, and then several hundred years in the future where the world has become a shell of what it once was. The remaining humans from New York City are now divided into two groups, the hunters and the hunted, the latter of which Alexander must protect. I would be lying if I said that I didn't enjoy moments of The Time Machine, as it is filled with eye-popping visuals that show a hint of brilliance. The scenes of New York in the future are an amazingly well-constructed blend of visual effects and set pieces, while Stan Winston's envisioning of the Morlocks are on par with the work the acclaimed creator has done in the past. But there is little to deny that these efforts are fighting with a script that lacks the creativity and general wonderment needed to make the film work. Rumors of trouble with the production surfaced after the film was completed, including one that Mousehunt director Gore Verbinski (he does get a thank you in the credits) was brought in late in the process to take over for Wells. After watching the film, I can say that I believe this rumor may have some validity, as the film feels uneven with the opening scenes showing great promise while the latter portions of the picture fall flat. This is most evident with the lack of exposition in the final act. This, in my opinion, is what plagues The Time Machine; the events that transpire after Alexander finds himself in the world of the Eloi and the Morlocks feel rushed and several key plot points are hurried through in favor of a collection of needless action sequences. Another area where The Time Machine falters is in the casting of its lead actors. Pearce, an actor I greatly admire, does a nice job as Alexander, though his work at times feels flat and uninspired. Mumba, making her film debut, fails to offer a memorable character with her limited screen time, while Mark Addy and Orlando Jones do their best to add some comic relief, but fail thanks in part to unfunny dialogue. 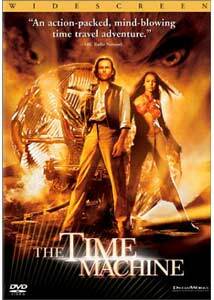 In the end, The Time Machine fails to obtain the heights of its source material. As a film that brings to life the world that so many have grown up imagining, The Time Machine is perhaps the ultimate proof that there is often no match for an expert work of literature. Image Transfer Review: As is often the case with titles from DreamWorks, the 2.35:1 anamorphic widescreen transfer is nothing short of stunning. The drab browns and tans of the future are very well defined, while the amber hues show no bleeding at all. As The Time Machine is a film with a vast color palette, the three main acts each have a distinct look and this transfer does a phenomenal job recreating them. Sharpness and detail are very good throughout; a perfect example of this is that I was able to read the names of businesses in the city sections at the start, where I was not able to do that when I saw the film in the theater. There are a very few instances where a bit of edge enhancement can be seen. Overall, this is a terrific transfer. Audio Transfer Review: DreamWorks has chosen to present The Time Machine with both a Dolby Digital 5.1 mix and a DTS track; each are near reference quality. From the start of the film to the final credits, the mix is always active with either ambient sounds in the rear speakers or the lush recreation of Klaus Badelt's score across the front soundstage. The surround mix comes to life with constant use of the rear speakers, where directional effects or even something as small as the sounds of old New York enveloping the room at the start of the film. Dialogue is crisp and clean throughout, while the .1 LFE channel offers nice bass in the climactic action sequences. A test between the two showed the DTS track to be the winner as it offers a better defined soundfield throughout. Extras Review: Though not a signature collection release, The Time Machine does include a host of special features. The first, and most important, are two commentary tracks by director Simon Wells and editor Wayne Wahrman, as well as another by producer David Valdes, visual effects supervisor Jamie Price, and production designer Oliver Scholl. The track by Wells and Wahrman is perhaps the better of the two, as the pair discuss the hassles of production along with sharing numerous anecdotes. Wells is especially well spoken and has an audible passion for the finished film, though I wish he had spoken more about his direct correlation with the source material. The second track is more technical than the first, as participants point out elements of the film that pertains to their area of expertise. Valdes and Price do the lion's share of the speaking, discussing aspects of the production including Price's near constant distinction between real and CG shots. Overall, each track is worth a listen, but there is little to actually take away from them. Next up are a series of six-minute featurettes that cover everything from the creation of the Morlocks to the visual effect sequences. They are largely promotional in nature, but for those looking for more information as to how certain elements of the film were created, this is a good place to look. A collection of eight Concept Design Sketches can be viewed with music and are a nice way of seeing what occurred in the transition from imagination to reality. These include numerous looks at the New York sequences from 1899 to 2037, as well as the creation of the Eloi and Morlocks. The selection of extra features concludes with a deleted scene that runs nearly six minutes and shows an alternate opening to the film, as well as cast and crew bios, the theatrical teaser and trailers. Production notes are also available on the disc as well as a booklet found inside the DVD case. Though the film is in no uncertain terms a disappointment, there is something to be said for this new DreamWorks DVD. The audio and video portions, as well as the plentiful extra features, are enough to warrant a recommendation for a rental, but nothing more. Those looking for the real deal either read the book or check out George Pal's original version.